We wanted to be sure to invite you all to an upcoming event this Friday night. 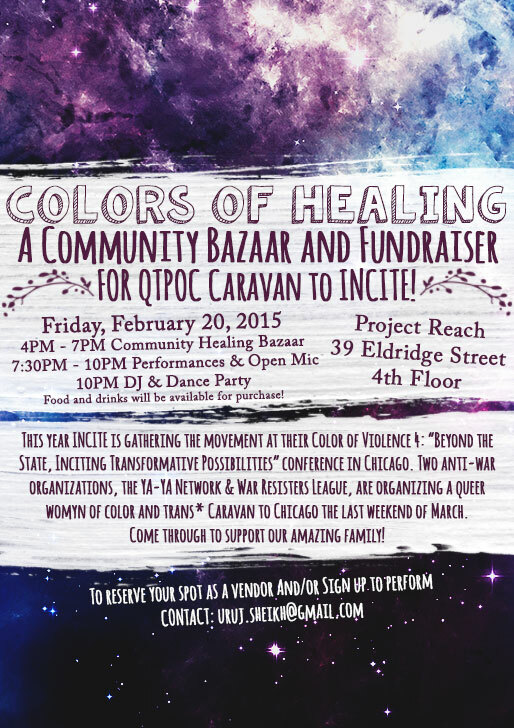 We’ll be vending at Colors of Healing to help get The Ya-Ya Network and War Resisters League to the INCITE Conference next month! We will have jewelry by our Core Sister Yexenia for sale, in addition to buttons, patches and pins for sale to benefit the legal campaign of the Guillermo Morales/Assata Shakur Student and Community Center of City College. We invite you all to come by and support this amazing event. There’s a dance party afterwards as well! ** We won’t be hosting a circle this month as our Intentions Circle was right at the end of January. Stay tuned for Women’s Herstory Month updates!